St Patrick’s Technical College is expanding and will soon be training the computer software engineers of the future as part of a national program which aims to boost the skills of Australia’s youth. Thanks to a new course at the college, Year 11 and 12 students can now study an industry-level qualification in software development under the guidance of a global Defence industries company. StPatsTech will introduce a TAFE SA Certificate IV in Programming in 2018 as part of the P-TECH program. Partnering with Saab Australia, students will be given a unique opportunity to learn from one of the Defence industries biggest players and set themselves up for a career that is in high demand. Saab Australia joined other P-TECH partners Century Engineering and PMB Defence to sign a Memorandum of Understanding at the Adelaide Careers and Employment Expo on May 26. StPatsTech principal Rob Thomas said he believed the College was the first secondary school in South Australia to offer the Certificate IV course to students. “We hope this will lead these students directly into the local Defence industries workforce and helps them broaden their career horizons,’’ Mr Thomas said. 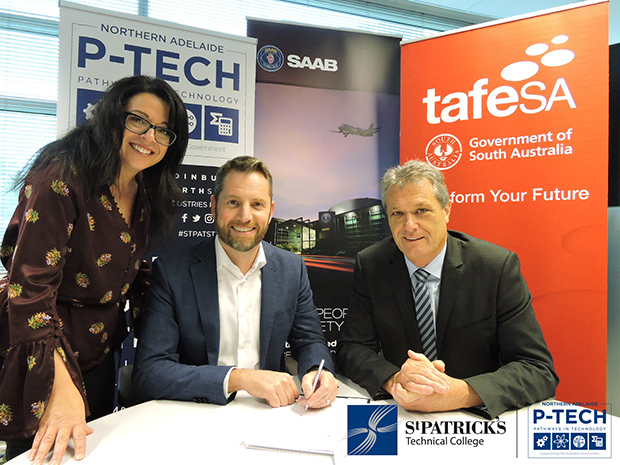 Dean Rosenfield, Managing Director Saab Australia, said the P-TECH partnership with St Patrick’s Technical College allows Saab Australia to play an active role in the learning and career development of its future technical workforce. “With so many significant defence industry projects planned for the next 20 to 30 years in Australia we will require a new level of people with specialist technical skills,’’ Mr Rosenfield said. TAFE SA’s Acting Director, Business, Information Technology and Justice Hilary Ashworth said the program with Saab Australia provides students with a career pathway enabling direct entry into employment within the growing national defence industry. The P-TECH program will see Saab Australia develop a project for students to gain skills relevant to the industry, mentoring, and work experience. This entry was posted in Latest News on 26/05/2017 by St Patrick's Technical College. St Patrick’s Technical College Engineering students will be given a unique opportunity to learn to weld to Australian Standard under the guidance of a local Defence industry company. 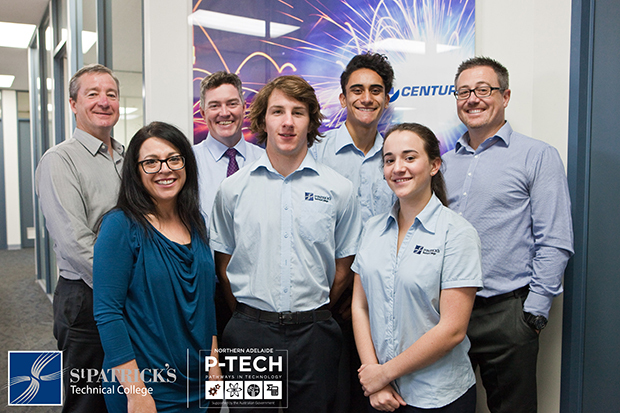 Century Engineering, located in the Edinburgh North Smart Industries Precinct, was one of the first companies to put its hand up to be part of the new P-TECH program being piloted at StPatsTech. StPatsTech College principal Rob Thomas said Century Engineering should be applauded for its proactive approach to a skills shortage within its sector. Century Engineering joined other P-TECH partners Saab Australia and PMB Defence to sign a Memorandum of Understanding at the Adelaide Careers and Employment Expo on May 26. “Through P-TECH we are able to not only provide students with real-life practical skills that will make them more employable in the future, but help industry fill skills gaps,’’ Mr Thomas said. Managing Director from Century Engineering, David Heaslip, said the company was keen to support the future in Defence engineering in Adelaide and help young people develop a vital skill within the industry. “I think it is to everyone’s benefit if we have students who are engaged and interested in these areas. Not everyone can work in an office or wants to. This will give them avenues to see how things work within the industry. It will also help to develop our industry by having them learn to weld to the Australian Standard,” Mr Heaslip said. “It is an industry requirement that manufacturing meets the Australian Standard but we do find tradesmen who are not fully familiar with the standards and that is why we really focussed this P-TECH course on welding management. He said the students will be introduced to welding and the requirements of Australian Standard AS1554.1 Structural steel welding Part 1 Welding of steel structures. The students will gain an understating of what the standard means, and why it is an essential requirement of fabricating a product that is fit for structural purposes and meets strict industry requirements. “The courses now on offer through StPatsTech are so exciting not just for the students taking part, but the companies partnering with the College,’’ said Toni Hartley who is rolling out the P-TECH program in Adelaide for the Skilling Australia Foundation. “While Northern Adelaide has taken a hit recently when it comes to manufacturing jobs, we really want to show young people that there are still jobs and new opportunities emerging in the region. Defence industries in the region are a huge economic driver and through P-TECH courses at StPatsTech, local students are able to tap directly into these opportunities,’’ Ms Hartley said. Century Engineering is a fully-owned South Australian company with a diverse profile across Defence, mining, power, water and rail industries. With more than 100 employees and a history that dates back about 65 years, Century Engineering has won contracts for the Air Warfare Destroyer project, the ANZAC Ship project and an artillery loading system project. The P-TECH program will also see Century Engineering provide mentoring and work experience for students. This entry was posted in Latest News on 25/05/2017 by St Patrick's Technical College.